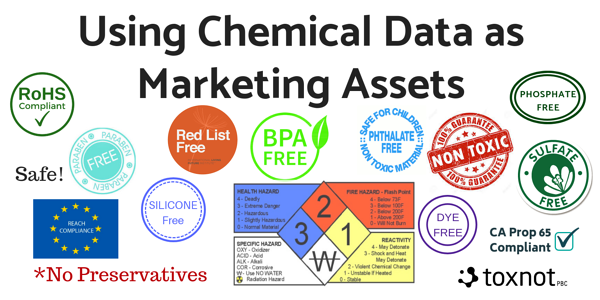 Chemical hazard data makes great marketing fodder. Sound a bit counter-intuitive? We thought so too, at first. But as we brainstormed for how we can best help our clients, and find new ones, we took a deep dive into all the aspects of a company that deal with chemicals in their supply chain- whether they realize it or not. Your marketing manager using a label (e.g. Declare) or tagline (e.g. BPA free) is using the knowledge in your supply chain to make a statement that resonates with consumers. Those press releases announcing a retailer’s priority chemical lists are using chemical hazard knowledge to sell their conscious brand to wary consumers. We want to start chemical transparency program, but don't know where to start! We pride ourselves on sustainability...but aren’t yet committed to transparency. Our company doesn’t want our customers to know what’s in our products! Starting a transparency program involves conversations with the right people in your organization. It could be a single person in the EHS or sustainability department, someone who is a liaison to these groups, a working group that involves people from different teams, or another solution that’s right for your organization. There is no one right way to make this happen. Begin with the end in mind. What do you wish to accomplish with your transparency program? Set goals for your program. Are you dedicated to reducing risks by fully understanding which chemicals are in your products? Would you like to use labels and taglines to demonstrate that your products don’t include harmful chemicals? Do you want to articulate that you are actively working on materials health and choosing to create a product line without harmful chemicals? Do some market research in your industry; understand what questions consumers are asking; read up on the latest chemical bans happening because of consumer advocacy (i.e. PFAS and methylene chloride); and be proactive. Some first-mover companies in your industry likely have published their chemical transparency goals and progress. Don't be shy- copy what works for you! We pride ourselves on sustainability, but aren’t yet committed to transparency. Sustainability is multi-faceted and a company may be caught up in the latest environmental issues (e.g. waste disposal, ocean plastics, climate change) while overlooking others (e.g. chemicals management). If you’re clear with customers which sustainability efforts you are prioritizing and why, they are more likely to give credit to your brand. Tell your customers how you define sustainable products and what you’re doing about it. Each industry has its unique challenges and the definition of sustainable can vary. With that being said, product transparency, or the disclosure of a product’s chemical make-up, is worth exploring. Just over a decade ago, many plastic baby bottles contained BPA, a chemical mixed with other compounds to make strong plastics. Perfect for a baby dropping and throwing bottles! However, BPA was demonstrated to be an endocrine disruptor and in In July 2012, the US FDA banned BPA from bottles and sippy cups. Parents everywhere grimaced with concern and started researching other chemicals in toys, their homes, food containers and elsewhere. The trend to understand what’s in our products has amplified from parents, to the larger population. In the past few years, nearly a dozen major retailers have taken steps to ban ‘priority chemicals’ from products on their shelves. The public is noticing. If your company truly hasn’t begun to consider being more transparent about what’s in your products, 2019 is a good time to start. It's actually surprising how little companies know about chemicals that make up their products. Understanding what comprises your products is important for a host of reasons. First, you need to ensure you’re sourcing raw materials from the best suppliers you can work with. Second, raw material prices fluctuant and have varying availability; it’s good to stay abreast of changing markets and how you may have to change course. Third, chemical regulations are always being updated. If you don’t know what’s in your products, how would you know if you comply? Keeping track of your material inventories (or bills of materials) is a great way to know what’s actually in your products. Years ago, as I sought to collect data for life cycle assessments, and collected a myriad of material data safety sheets (MSDS), I learned firsthand that many companies believed the composition listed at the Research and Development department was the exact formulation used in manufacturing facilities. This was true only part of the time. Talk to the manufacturing team to get a real sense of what’s being used. If you don't receive the answers you need, engage your suppliers. If you discover ingredients in your products that are known to be harmful to human health or the environment, it’s a great opportunity to find a safer alternative, and let your customers know about the effort! You don’t purposely advertise what’s in your products because you don’t legally have to, and every time you turn around, another advocacy group is condemning another chemical for human or environmental hazards. Perhaps the resin you’re using is on the IFLI red list, but you've chosen to keep it in the product for good reason. For example, you could explain why the properties it has are crucial to the longevity of your products, and beyond understanding toxicity, you are actively engaged in prolonging the lifecycle of your product so it doesn’t end up in a landfill. Today, consumers want to know that you’re making an effort. “Transparency” and “sustainability” can be hard to define in each industry, but consumers love a good story on positive change. Commitments to waste reduction, carbon offsets and recyclability are lofty goals that many businesses herald. It’s time to do the same with your transparency goals. Involve your customers with progress towards your goals, ask them for feedback, and once they feel they’re part of the solution, brand loyalty ensues. I remember as a child, when red-colored M&Ms were (re)introduced and learned, for the first time, about toxic dyes. My parents and I suddenly wanted to know more about all the ingredients in our food! (There was public miscommunication about which foods contained the notorious Red No.2 (M&Ms did not), but Mars pulled the red candies just to ensure the public knew their candy was safe and sales wouldn’t decline due to consumers avoiding all red candy.) The public’s response to negative claims about chemicals is even more skittish today. Information, and misinformation, is spread faster than ever. Stay on top of which chemicals NGOs, individual states and large retailers are looking to ban so you can steer clear of these chemicals, or start innovating now. I’m not making the case to use your MSDS library or CA Prop 65 checklists in your marketing materials. Though, I’m sure finding a way to creatively market some of that information could be on-trend! Knowledge is power and many consumers want to know what they’re buying. By using what you know about your products, highlighting the efforts you’re undertaking to make your products safer, and sharing your long-term goals, you can create marketing materials to include your customers in your chemical transparency journey, from beginning to end. Ready to get started with transparency at your company? Download our free Product Transparency ebook.